The American Society for Jewish Music has launched the New Jewish Music Forum. Speaking in New York at the Center for Jewish History last Friday on Feb. 11 was Edwin Seroussi, Head of the Jewish Music Research Center located at Hebrew University in Jersualem. Seroussi, who spoke on “Studying Jewish Music in Israel: Achievements, Failures and Challenges for the Future,” also has a recently released book called “Popular Music and National Culture in Israel.” Seroussi’s talk centered on both the historic and political as well as artistic influences that shaped the course of Israeli music. Mark Kligman of Hebrew Union College-Jewish Institute of Religion moderated. His respondent at the forum was Professor Stephen Blum, City University of New York. Professor Seroussi is also the Emanuel Alexandre Professor of Musicology at the Hebrew University in Jerusalem. The New Jewish Music Forum is being led by distinguished musicologists: James Loeffler of Columbia University as Executive Director of the Jewish Music Forum, ASJM Board Member Mark Kligman as Academic Chair, and Judah M. Cohen of New York University as Vice-Academic Chair. 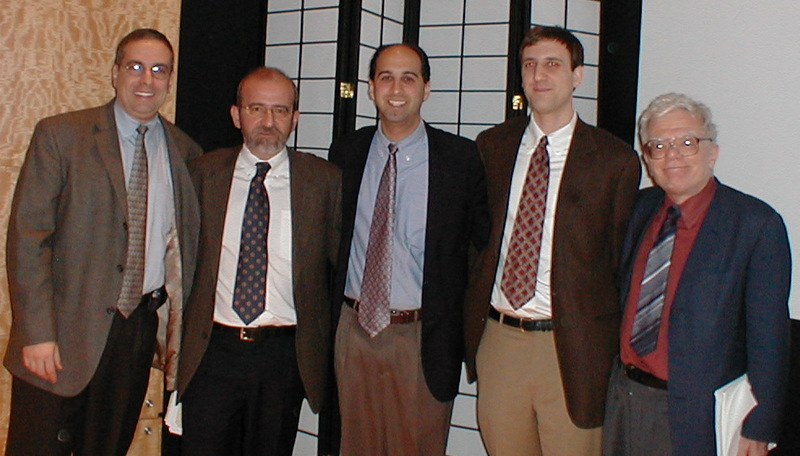 Photo (from left to right): Mark Kligman, Edwin Seroussi, Judah Cohen, Jim Loeffler, Stephen Blum.